Beginners’ guide: What are the rules, what do the jerseys mean? Mark Cavendish was involved in a high-speed crash at the Tour de France after the British sprinter appeared to be elbowed into the crash barriers at the business end of the fourth stage into Vittel on Tuesday. 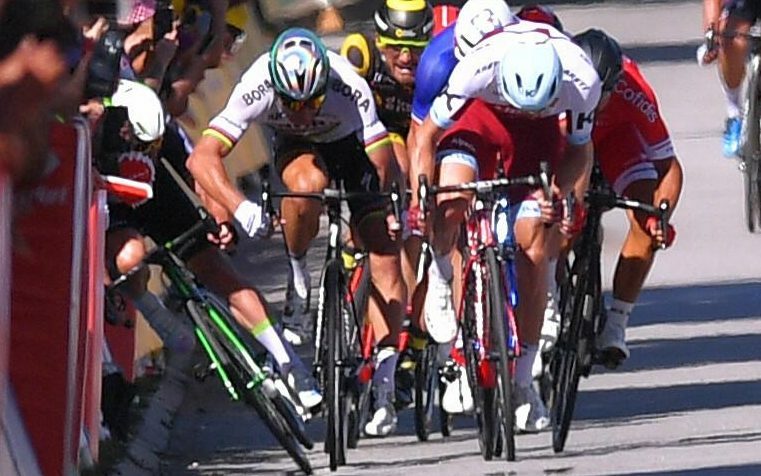 After going up the inside of Peter Sagan, the two-time world road race champion, Cavendish hit the roadside barriers at around 60km/h sustaining numerous injuries that may end his race. Speaking outside his team bus, Cavendish admitted he was “not optimistic” about making the starting line on Wednesday. Cavendish, who arrived at the Tour out of sorts having suffered with glandular fever, had started to rediscover the form that led to him winning 30 stages at the race, just four short of the great Eddy Merckx. However, Tuesday’s crash could see the Dimension Data rider withdraw. Sagan disqualified from the Tour de France! Peter Sagan, the two-time world road race champion, has been disqualified from the Tour de France for “seriously endangering” another rider. Crikey. Sagan was initially docked 30 seconds in the general classification competition after nudging Mark Cavendish into the barriers towards the end of stage four, which was won by Frenchman Arnaud Démare. But the race jury looked at the incident again and announced that the Slovakian’s participation – and his bid to win a record-equalling sixth straight green jersey – is over. “We have decided to disqualify Peter Sagan from Tour de France 2017 as he endangered some of his colleagues seriously in the final metres of the sprint which happened in Vittel,” said race jury president Philippe Marien. Cavendish was taken to hospital with his right arm in a sling after taking a nudge from Sagan and falling into the barriers, causing other riders to fall behind him. There are quite a number of people, mainly Twitter people admittedly, who are saying Sagan’s disqualification is a little harsh. That may be the case, but let’s just cast our minds back to July 2010 when Mark Renshaw, Cavendish’s loyal lieutenant and long-time lead-out man dropped his loaf of poor old Julian Dean during a sprint finish into Bourg-lès-Valence.